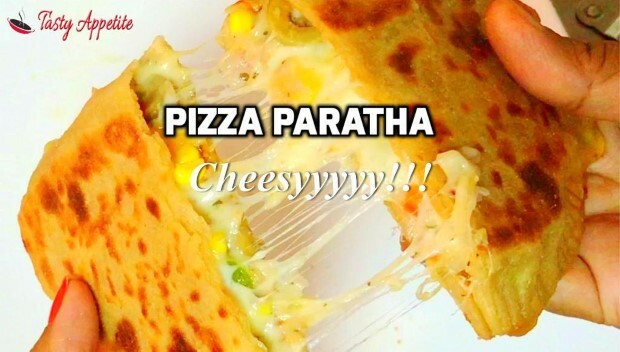 Here comes the westernized pizza recipe with a desi touch - Pizza paratha recipe. Kids go crazy by hearing the name Pizza. Its easy to prepare this pizza paratha at home with a delicious healthy touch in it. In this recipe the paratha is stuffed with pizza sauce, veggies, cheese and with aromatic spices. It tastes lipsmacking with cheesy n gooey with inviting aroma and awesome taste. It makes ideal for kids snacks / lunch box. In this video recipe, lets see how to prepare delicious pizza paratha at home! Add 1 cup of warm water in a mixing bowl. Add 1/2 tsp of salt and sugar. Add wheat flour little by little and knead to smooth soft dough. Add a tbsp of oil and knead soft. Cover the dough with a wet cloth and let the dough rest for 5 mins. Now knead the dough again and divide to equal sized balls. In a frypan, heat 1 tbsp of oil. Add sliced red capsicum and green capsicum. Toss for a minute and turn off the flame. Add sliced jalapenos, olives and mozarella cheese. Add italian seasoning, mixed herbs, red chilli flakes and pepper pwd. Take a dough ball and roll it to thin round discs. Smear 1 tbsp of pizza sauce on it. Place 2 to 3 tbsps of stuffing (as shown in video) and spread. Now close one side of the paratha to the other end and seal the edges. Place the stuffed paratha carefully. Cook on both sides until it's golden brown. Cheesy...gooey pizza paratha is ready. Kids enjoy this healthy stuffed paratha along with tomato ketchup or any dip of their choice.